Own a piece of women's hockey history. We have t-shirts and old varsity jerseys. 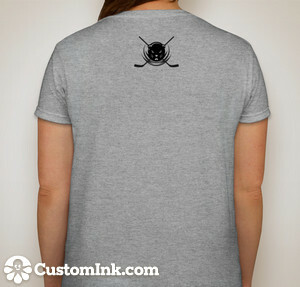 Get your very own custom t-shirt to show support for MIT's hockey programs. Both men's/unisex and women's styles available. Youth sizes available for the men's/unisex style. 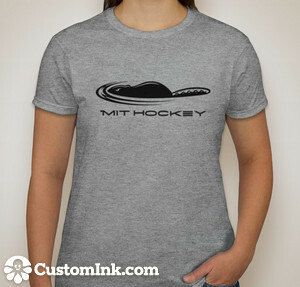 Please fill out the t-short order form or email club-hockey-fundraising [at] mit [dot] edu for ordering and delivery options. You can pick up the shirts on MIT campus or if you want it mailed to you add $5 shipping and handling for a total of $20. Don't want to buy another t-shirt for your already brimming closet? We rely on donations from alumni, friends, and family to maintain the quality of our program. Any amount helps keep us going on the ice. You can donate to the MIT Women�s Ice Hockey program through the Giving to MIT website. Your contributions are tax-deductible and will go directly to supporting us. Click on the icon below to donate now!